Pamper your gift with some precious purple wrapping. All of your friends and family members will feel like royalty when they receive a gift wrapped in this purple satin! It’s easy to wrap presents when you have the perfect materials to do so. 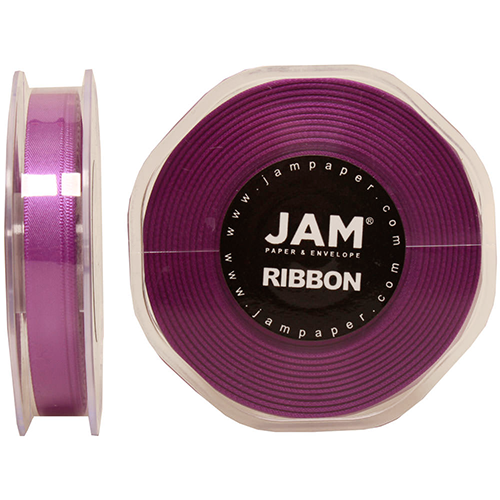 The luxurious color and double-sided shine of Purple Satin Ribbon guarantees that your gifts look their best. And since a gift is never fully dressed without the wrapping, finishing it off with some of this pretty ribbon completes the whole package. Pair it with elegant wrapping paper and a thoughtful card for a present to be proud of. Satin Ribbon can also be used for sewing projects, arts & crafts, and party decorations. Get creative with your ribbon and know that whatever you create, the ribbon will retain its shine and color.